For decades, Saturday Night Live (SNL) has remained a popular theater-going outlet for locals and travelers to New York City. As a result, live SNL tickets are hard to come by. However, most city visitors don't know the insider tricks that will land them a seat at the live filming. With a little trip planning, you can order tickets ahead of time (producers want to make sure the audience is packed). Or wing it, New York style, by lining up for standby tickets the day of the show. Once inside the live taping, you're bound to have a night of laughs with some of your favorite television personalities. 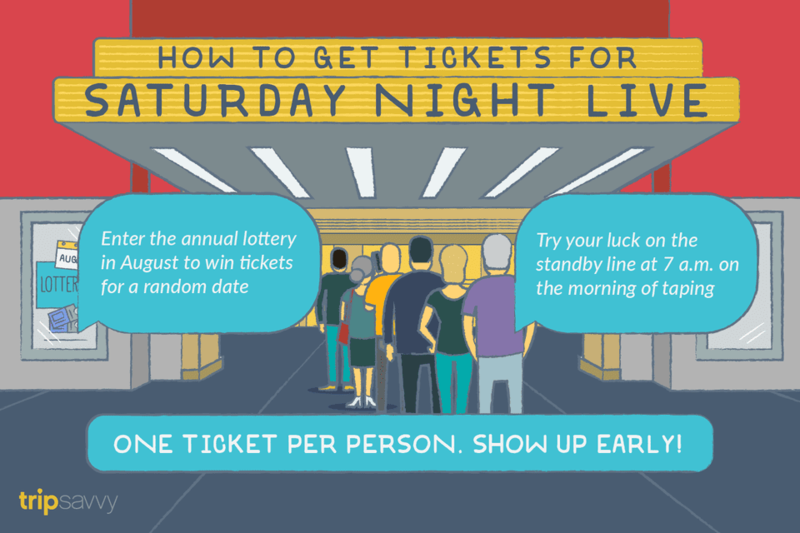 Plan your SNL night out a summer ahead of time by applying for the ticket lottery in August. Simply submit a request to NBC Studios via email, stating why they should pick you as part of their studio audience. Be sure to include your name, phone number, email address, and mailing address in the body of the email. But note that only those who are selected will receive an email confirmation in September. If you win, two tickets to either a live taping or a dress rehearsal on a random date will be coming your way. However, since you can't request a date to attend the taping, you may find it difficult to plan this New York City outing as part of a trip itinerary. What are your chances of winning? Well, some people certainly get lucky (or have a really great story), but honestly, it's a crapshoot. Not all is lost, however, if you don't hear back. You can always go stand-by when you get there. Stand-by SNL tickets are distributed at 7:00 a.m. on the morning of the taping under the "NBC Studios" marquee on the 48th Street side of Rockefeller Center. Stand-by tickets are a great way to go if you want to make sure to view the taping on the exact date you visit New York City. But keep in mind that many people line up for tickets well in advance, so if you show up within an hour or so of distribution, you might lose out. Once you join the line, expect to stay in it for the duration with only a short break to grab a coffee or use the restroom. And check Saturday Night Live's website to be sure an airing for your chosen day is planned before you wait in line. SNL standby tickets get you into either the 8:00 p.m. dress rehearsal or the 11:30 p.m. live show and only one ticket is issued per person (make sure your entire group endures the line together). But note—a standby ticket does not guarantee admission. You still have to show up to the theater at the admission time to confirm they have the seats available. SNL ticketing is limited to audience members over the age of 16. And be aware that both weather and the evening's guest host play a big role in the availability of standby tickets (and also how early people start to line up). If you're lucky enough to score one of these exclusive passes to the filming, arrive no later than 7:15 p.m. for the dress rehearsal and 10:45 p.m. for the live show to see if they have room for you. And bring a sweater or jacket to the taping—they pump the studio full of refrigerated air to keep both the actors and the audience on their toes.